Liu, X., et al. FEBS Lett. 584(18):4115-4120 (2010). Sijmons, R.H., et al. Fam. Cancer 9(3):439-442 (2010). Kedde, M., et al. Cell Cycle 7(7):899-903 (2008). Linger, R., et al. Genes Chromosomes Cancer 47(3):247-252 (2008). Ketting, R.F. Cell 131(7):1226-1227 (2007). DND1 monoclonal antibody (M07), clone 2G11. Western Blot analysis of DND1 expression in NIH/3T3 ( Cat # L018V1 ). DND1 monoclonal antibody (M07), clone 2G11. Western Blot analysis of DND1 expression in Raw 264.7(Cat # L024V1 ). DND1 monoclonal antibody (M07), clone 2G11 Western Blot analysis of DND1 expression in Hela NE ( Cat # L013V3 ). DND1 monoclonal antibody (M07), clone 2G11. Western Blot analysis of DND1 expression in PC-12(Cat # L012V1 ). 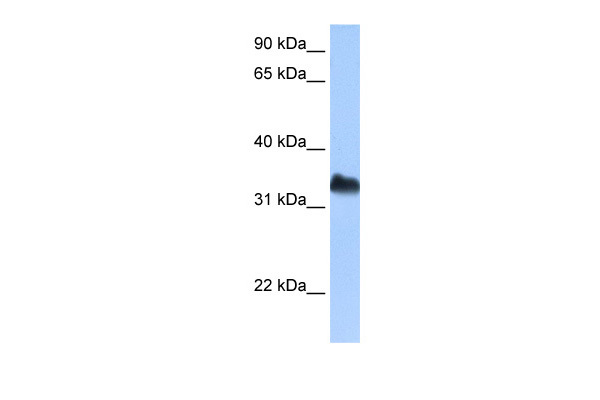 Western blot analysis of DND1 Antibody Cat.-No AP51300PU-N in Hela cell line lysates (35ug/lane).This demonstrates the DND1 antibody detected the DND1 protein (arrow).